An interesting thing is happening on Route 193, which goes through Great Falls, Virginia. Rats! I only wrote one sentence, and I made two mistakes in it. First of all, although it is technically Route 193, signs have sprung up telling us that it is “Virginia’s Byway” — “The Byway,” for short. 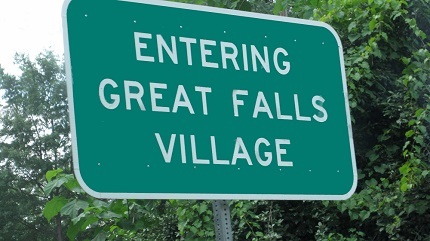 And Virginia’s second-snootiest city (McLean is the first, for you trivia buffs) is now being referred to on actual signs as “The Village.” The official name for you Plebeians is still Great Falls, mind you. It is only those lofty souls who live there and we lowly twerps who are allowed to stop at the Subway there on our way home from the temple who are allowed to bandy that sacred name. We who are in the in group know that Great Falls, Virginia, is not just your basic lowly town. 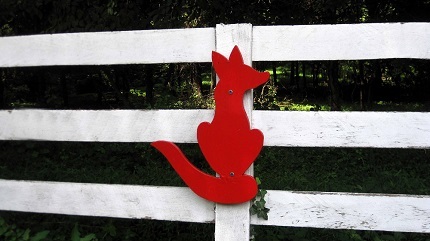 Anyway, an interesting thing is happening on “The Byway,” which runs through “The Village.” Suddenly, an influx of wooden woodland creatures has been springing up willy-nilly along fences and gates and anywhere else that will take a nail or a bolt. 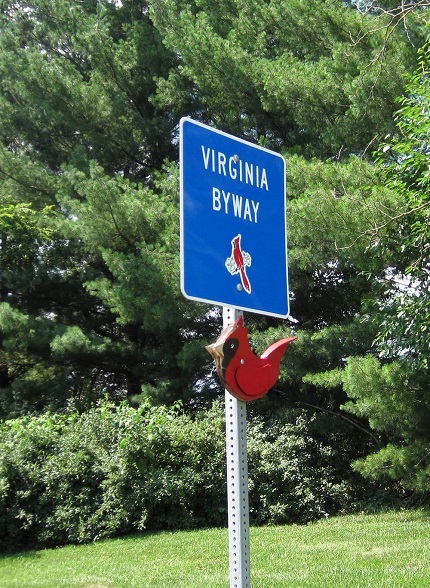 The original unoriginal cardinal on one of “The Byway” signs started an ominous trend. But the “The Byway” sign at the other end of The Byway got a three-dimensional sign on it that was less distinguishable. It was a blackbird, or maybe it was a raven, or maybe it was a crow. For all I know, it could have been a grackle. It was not labeled. Fine art seldom comes with an explanation. Soon after the first two signs found wooden woodland birds perched on them, two more birds perched on local signage. These landed on the signs at the Betty Cooke Memorial Bridge, and once again one was quite recognizable and the other was considerably less so. The recognizable bird was not a cardinal this time. It was a gray owl with unsettling yellow eyes. It also had something fuzzy on the front that was allegedly feathers, although it looked suspiciously like chest hair. 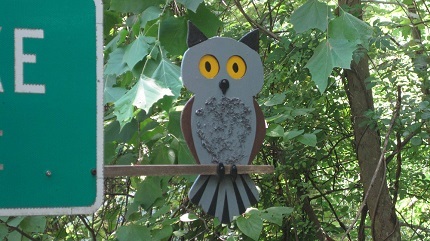 The owl, complete with spooky eyes and feathers or chest hair, had been attached to the sign about two inches off to the side, as though the sign were embarrassed to claim it. Betty Owl’s yellow eyes could cause nightmares in small children. They could cause nightmares in certain adults, too. Adults like me. The bird on the other side was the crow-raven-blackbird-grackle, which caused and continues to cause some confusion in the Kidd household. You see, we always said, “Hi, Betty,” when we crossed the bridge. Now we say, “Hi, Betty Owl,” when we cross the bridge going east. What do we say when we cross the bridge going west? We never say it the same way twice. Is it, “Hi, Betty Crow?” or “Hi, Betty Blackbird?” or “Hi, Betty Something Else?” One never knows for sure. With all the birds in Virginia, one would think the bird installers could have come up with something other than the black thing, especially considering they had already put the black thing on another sign. Originality was not high on the priority list of the people who installed the wooden woodland creatures. But not to worry! Where the local officials dropped the ball, the Village residents picked it up and are dribbling it all the way up The Byway. Taste is not the issue here. 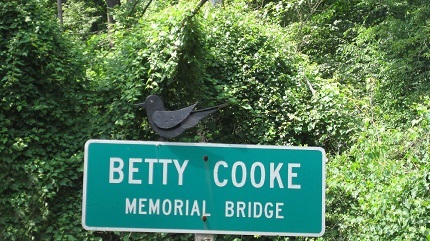 But of course we established that the moment Betty Owl took her perch over the Betty Cooke Memorial Bridge, with her spooky yellow eyes and the feathers that look like chest hair. 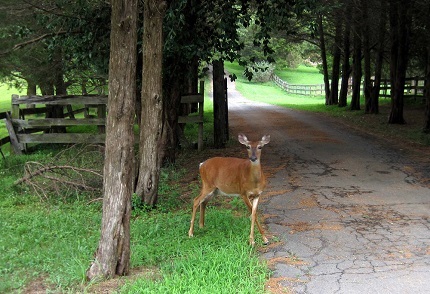 It did not take long for a local denizen of The Village to join the fun. As we were driving home from the temple one week, we noticed a huge flat fox gracing somebody’s front gate. It looked as though somebody had flattened a fox in a motor vehicle accident and traced its outline on the pavement in chalk. Then he had transferred the chalk outline to wood and painted it bright red to be a permanent remembrance of the kill. We were thrilled. Our drive down The Byway through The Village is a scenic one anyway, as you would expect it to be. But now that one resident had broken the ice, we expected to see souvenirs of anything the other residents bagged on their drives up and down The Byway. Possums. Equestrians. Garbage trucks. Alas, the fox lasted only a few weeks. Apparently the town council of The Village was not amused. The village resident, however, was not to be denied. In the place of the fox, he installed a miniature wheelbarrow. I would have to take it down to see if it is indeed a working model, but I would suspect it is fully functional. I would also suspect it could injure you something fierce if it fell on your head. The wheelbarrow that took the place of the fox. 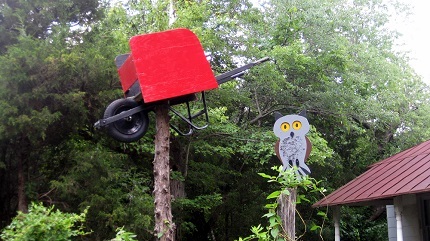 You may notice that a twin to Betty Owl, complete with feathers or chest hair, is hovering nearby to stand guard over the wheelbarrow. The deer that watched Fluffy take pictures of the wheelbarrow was obviously a Mormon, as evidenced by the “Modest is Hottest” crossed legs. Although this deer has not yet been flattened in a motor vehicle accident, painted a gaudy color, and nailed to a fence, its time may come. Months went by. We thought we had seen the end of the flattened fox. Then, just a couple of weeks ago, we saw a familiar flash of red as we were zipping up The Byway on our way home from the temple. We could hardly wait until we went to the temple the following week so we could confirm our flat fox sighting. (Yes, it is apparent that Fluffy and I are not spiritual giants, but if you are regular readers of this column you knew that already.) We went down the road with bated breath. And then … we forgot to look. We had to wait a whole nother week. But the following week we did remember to look, and we were not disappointed. Way down at the McLean end of The Byway, right at the end of the property of The Madeira School, there it was. It was nailed to a fence that may have been on the property of The Madeira School itself. Here is the flat fox that used to be where the wheelbarrow now stands. The good news is that this location is in McLean rather than in The Village, so the fox is in no danger of being taken down and thrown away by the big shots in The Village. The flat fox was just as red and horrible and delicious as we remembered it. And it was in McLean, not The Village, so it probably isn’t going anywhere. This is good news. Of course, Betty Owl and Betty Blackbird/Crow/Raven/Grackle and the beginning of The Byway are also in McLean, so now I’m getting confused. I’d better not think about this anymore because my brain is starting to hurt. But I do hope we are going to be seeing some more wooden woodland animals, because Fluffy and I are enjoying them, no matter which town they happen to inhabit.